Lake Orumiyeh (also Orumieh or Urmia) in northwestern Iran is one of the world’s largest landlocked salt lakes, but it is shrinking. Orumiyeh is fed by roughly 60 rivers and streams—some permanent and some ephemeral—that also deliver salts. Because the lake lacks an outlet, those salts accumulate in the basin. As the region’s arid climate evaporates the water, the salts crystalize along the shore. 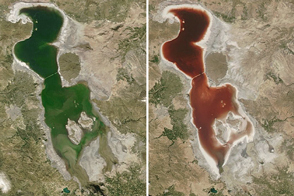 The Thematic Mapper on the Landsat 5 satellite captured these natural-color images of Lake Orumiyeh on August 13, 2011 (top), and August 25, 1998 (bottom). The most obvious difference between the two images concerns the rocky outcrop near the image center. 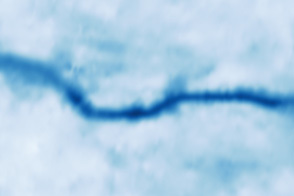 In 1998, it is an island. 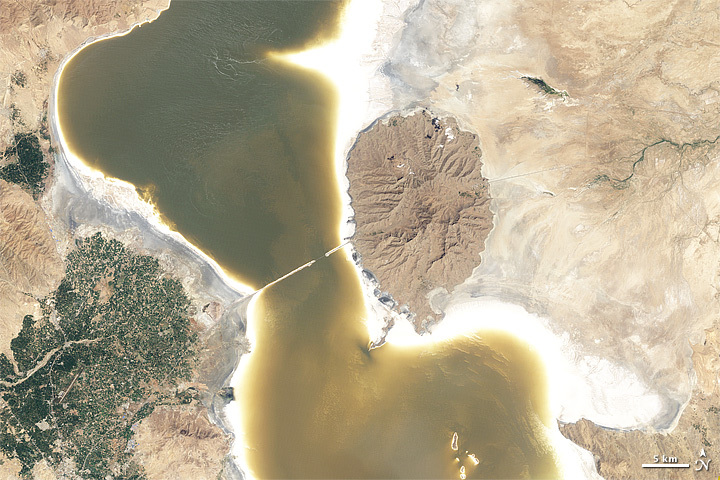 In 2011, it is surrounded by dry land. 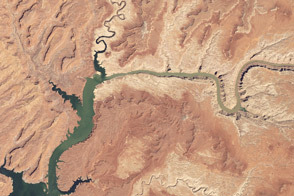 Satellite observations of Orumiyeh’s surface levels show an overall decline of about 4 meters between 1992 and 2011, with an increase in water levels in the mid-1990s. The cause of Orumiyeh’s depletion has been disputed. 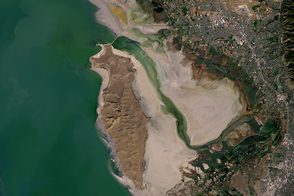 The Iranian government blames climate change and drought, while many citizens blame damming of rivers by the government, The Guardian reported in September 2011. Protesters expressed concern over the increasing exposure of the lakebed, including the possibility that windblown dust could carry harmful salts to nearby agricultural fields or endanger human health. 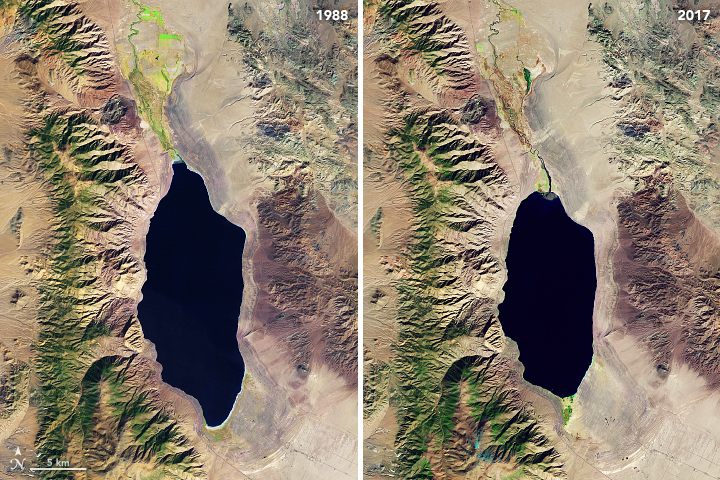 A study published in 2007 concluded that both drought and increased demand for irrigation water contributed to the lake’s falling water levels and rising salinity. The study cited growing populations in the surrounding area and the consequent need for potable water. 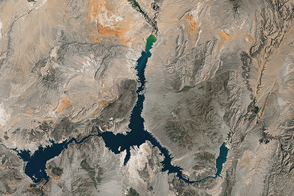 To assess Orumiyeh’s water levels in the 1990s and 2000s, the study relied on satellite observations from the Thematic Mapper and Enhanced Thematic Mapper Plus sensors on Landsat satellites. 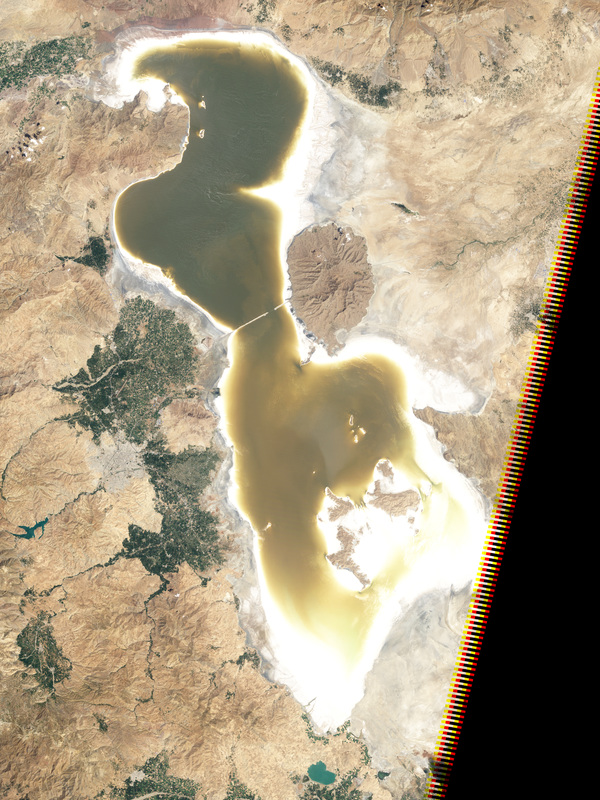 Lake Orumiyeh is one of the world’s great salt lakes, but it is shrinking. Dehghan, S.K. (2011, September 5). Iranian greens fear disaster as Lake Orumieh shrinks. The Guardian. Accessed October 27, 2011. Eimanifar, A. Mohebbi, F. (2007). Urmia Lake (Northwest Iran): A brief review. Saline Systems, 3(5). Foreign Agricultural Service. (2011, August 11). 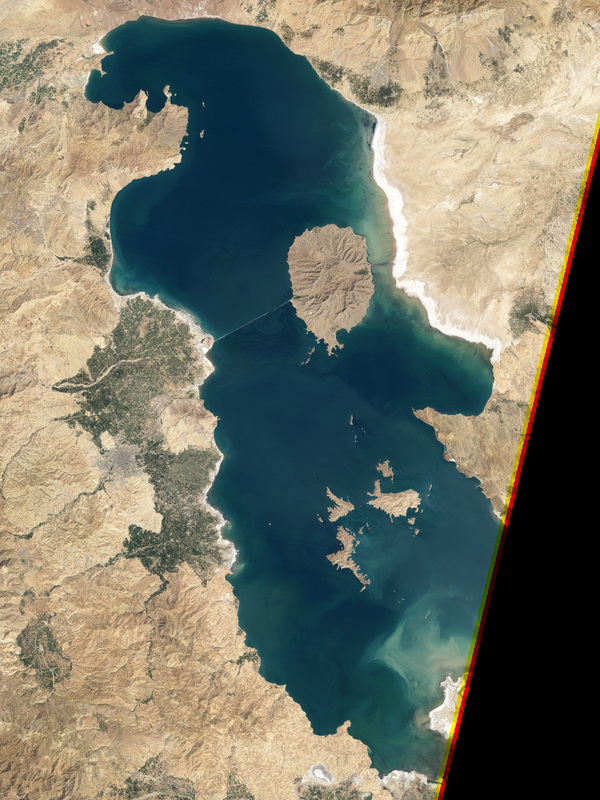 Lake Urmia Height Variations. Accessed October 27, 2011. Ghaheri, M., Baghal-Vayjooee, M.H., Naziri, J. (1999). 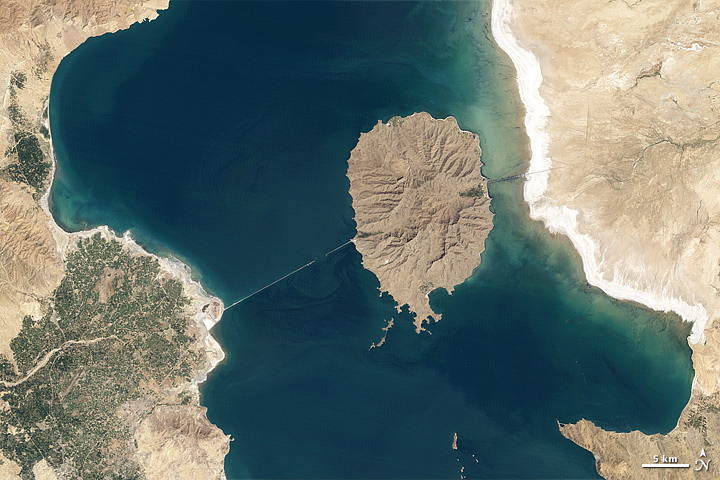 Lake Urmia, Iran: A summary review. International Journal of Salt Lake Research, (8), 19–22. Sigaroodi, S.K., Ebrahimi, S. (2010). Effects of land use change on surface water regime (case study Orumieh Lake of Iran). 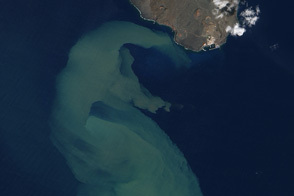 Procedia Environmental Sciences, 2, 256–261.